Palestinians: Arab Idol or Arab Apartheid? It was not Abbas's meeting with the Arab Idol contestants that sparked a wave of denunciations from Palestinians. Rather, it was his failure to set foot in any of the refugee camps surrounding Beirut or in other parts of Lebanon. Abbas knows very well that if he had so much as set foot in a refugee camp in Lebanon, it might have been the last step he would ever take. The residents of the refugee camps are furious with their leaders, who have kept them there for decades, lying to them about a mythical return to their forbears' homes in Jaffa, Haifa, Acre and Ramle. That is the real reason Abbas and other Arab leaders stay as far as possible from these miserable holding-pens. What could possibly be said against a leader who supports and encourages art, especially music, singing and dancing of youths? A leader who does so, particularly one from the Arab world, should be commended for such efforts. The catch: except when a leader says that supporting singers and musicians takes precedence over solving basic problems facing hundreds of thousands of his people. Take, for example, the case of Palestinian Authority (PA) President Mahmoud Abbas, who recently visited Beirut for talks with Lebanese leaders on a wide range of issues pertaining to bilateral relations and the status of more than 500,000 Palestinians living in extremely harsh conditions in numerous refugee camps throughout Lebanon. Many of the camps have long been "no-go zones" for the Lebanese security forces; this situation has turned them into bases for anarchy, lawlessness and a home for various rival armed gangs, which sometimes kill each other. 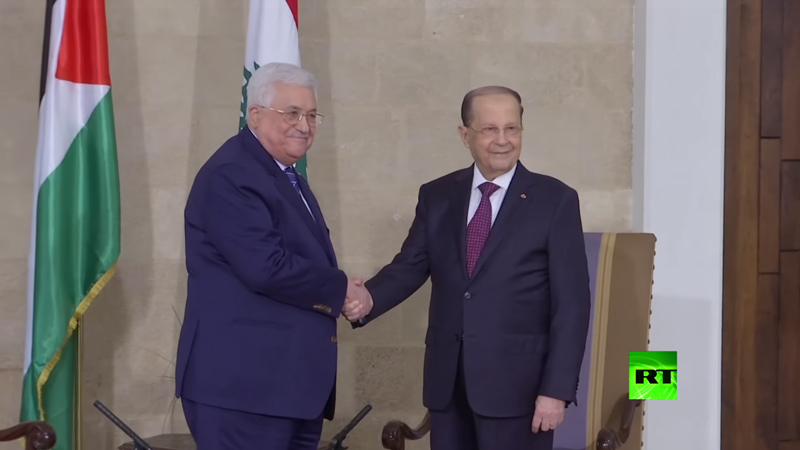 During his three-day visit to Lebanon, President Abbas held a series of meetings with Lebanese President Michel Aoun and scores of Lebanese government officials and politicians. He also met with some representatives of the Palestinian community in Lebanon. Abbas, however, steered clear of any of the refugee camps, where Palestinians are deprived of basic rights, particularly employment. Striking to many Palestinians was that Abbas did find time to meet with three young men participating in the hugely popular Arab Idol show, based on the British show Pop Idol. One of the contestants, Yacoub Shaheen, is from Bethlehem, while the second, Ameer Dandan, is an Arab citizen of Israel, from the Galilee. The third contestant, Mohammed Alazaki, is from Yemen. (Shaheen, a Palestinian Christian, won the television song contest). It was not Abbas's meeting with the Arab Idol contestants that sparked a wave of denunciations from Palestinians. Rather, it was his failure to set foot in any of the refugee camps surrounding Beirut or in other parts of Lebanon. Many Palestinians suspect that Abbas timed his visit to Lebanon so that he could meet with the Arab Idol contestants and be there when the identity of the winner was announced. They noted that Abbas is a big fan of the television show and has been closely following it for the past few years. His son, Yasser, and several senior Palestinian figures often travel to Beirut to attend Arab Idol. On his visit to Beirut, Abbas also found time to meet and exchange jokes with the famous Emirati singer Ahlam, who is also one of the judges on the Arab Idol show. Abbas's enthusiasm for the singers and the Arab Idol show is downright heartwarming. Many Palestinians, however, were left wondering about compassion for the hundreds of thousands of Palestinians living in Lebanon and who are being exposed to apartheid, discriminatory laws and severe restrictions that have turned their refugee camps into ghettos. Time on these diplomatic visits is rather limited: how, they wonder, did Arab Idol contestants and Ahlam the singer and judge make the cut, and the suffering compatriots did not? "From my point of view, there is no problem with President Abbas's care for art and singers, including following the Arab Idol show or any other program. Nor is there a problem if President Abbas devotes time for a meeting with the esteemed singer, Ahlam. The problem is that Abbas is not the president of Sweden or Norway that he can afford so much time on a television show. Is it conceivable that a Palestinian president would visit Lebanon for talks with Lebanese officials without going to see his people in the refugee camps, some of which are very close to the studios of Arab Idol?" Abu Zayda's views have since been echoed by a large number of Palestinians, who see Abbas's intentional ignoring of the Palestinian refugees in Lebanon as part of the Palestinian leadership's long-standing policy of turning its back on the plight of its people and preferring to deal with "trivial" issues. While Abbas was in Lebanon, armed clashes erupted between Abbas loyalists and followers of his chief rival, Mohammed Dahlan, in the Ain Al-Hilweh refugee camp. At least one person was killed and three wounded in the confrontation. Abbas, in fact, had no time to deal with the deteriorating security situation in the refugee camp because he was too busy thinking about who would win the Arab Idol contest (Palestinians argue his preferred candidate was Yacoub Shaheen from Bethlehem). "We thought President Abbas and the entire Palestinian leadership came to Beirut to discuss the tragic conditions of the Palestinians in the refugee camps," wrote a number of Palestinians on social media. "But we soon discovered that the real purpose of the visit was to attend Arab Idol. What a disgrace!" Referring to Abbas's obsession with Arab Idol, other Palestinians launched a hashtag on Twitter: #AbbasFollowUsToo. The goal of the campaign is to express Palestinians' disappointment with their leaders' carelessness and disdain. "do not enjoy several important rights; for example, they cannot work in as many as 20 professions... Around 53 percent of the Palestinians in Lebanon live in 12 refugee camps, all of which suffer from serious problems, including poverty, overcrowding, unemployment, poor housing conditions and lack of infrastructure." Abbas, however, is nothing if not savvy. He knows very well that if he had so much as set foot in a refugee camp in Lebanon, it might have been the last step he would ever take. So he was smart to stay away from the refugee camps, where his people bleed and which have become militia bases for armed gangs that are affiliated with so many groups, including his own Fatah faction. Yet, it is not only Lebanese refugee camps in which Abbas feels a bit edgy. Similar camps in the West Bank and the Gaza Strip are also teeming with bitterness. The residents are furious with their leaders, who have kept them there for decades, lying to them about a mythical return to their forbears' homes in Jaffa, Haifa, Acre and Ramle. That is the real reason Abbas and other Arab leaders stay as far as possible from these miserable holding-pens. That is also why Palestinian leaders do not care if Lebanon or any other Arab country treats Palestinians as second- or third-class "citizens" (Palestinians in any case cannot be citizens because, with the exception of Jordan, Arab countries deny them the right to citizenship). And that is why Abbas would rather spend time with Arab singers and Arab Idol contestants than confront those he betrays on a daily basis -- people being subjected to real apartheid and discrimination in Lebanon. The people being kept in these camps are being used by the various Arab countries and the supposed Palestinian leadership (and have been since 1948) to maintain a public hatred against Israel. Otherwise, they would have blended in to the population of neighboring countries and disappeared long ago, and there would be no Palestinian problem. Neither Abbas, nor any of the other so-called Arab leaders cares anything about these people, other than as a tool to keep up Arab support for the elimination of Israel (and maintain the power and wealth of Fatah,Hamas,etc.). Arabs who did not listen to the Arab high commend in 1948 to leave to make it easier to destroy the Jewish state are today a fifth of the citizens of the Jewish state of Israel. They vote, are elected to the Knesset serve in the Supreme Court, Foreign service... The Arab refugees who listened do not have citizenship wherever they ended in Lebanon or Syria. The one who were unlucky and ended in the Gaza strip created by Egypt to prevent Arab refugees from ending in Egypt are stuck with Hamas. In Syria the camps of Arab refugees have been bombed by their fellow Arabs and all along no citizenship, no work, no rights for generations within a state of their "brothers." Same in Lebanon and Jordan. They exist from the Tax Dollars going to UNWRA supporting the Arab refugees as non- Citizens and ready made Islamic terror candidates. Yet all over the world they talk of Apartheid Israel! Money, wealth, success, and power are only held by Palestinian Authority "leaders". Turning their backs on their own people is why I hope so resolutely that the extremists in the Gaza Strip and the West Bank, who plummet the depths of their people's condition, truly see who their oppressors really are. Abbas should have stayed in Beirut. Since when have Arab "leaders" --- any so--called "leaders" --- given a hoot about the Palestinians or any other poor Muslims??? So--called Arab "leaders", care about themselves, Period. As for Mahmoud Abbas --- now here we have a "great leader" --- who cares about one person only --- HIMSELF!!! Unfortunately, that is exactly what most Arab "leaders" care about --- THEMSELVES. The only hope for any solution to the Palestinian problems is Israel --- the only real friend the Palestinians ever had. Muslim "leaders" use the Palestinians in their hope to get rid of Israel --- that is all the world needs --- another Muslim country. Thank you Khaled Abu Toameh and Gatestone. Aren't we a bit curious what is actually being said during all these meetings? It can't be anything to the benefit of Palestinian Arabs, otherwise they wouldn't still sit miserably in refugee camps after so many years while the exiled Arab Jews have build a country and prospered. Could it be a meeting about how/where to invest/put money, where to buy the latest fashion suits, making travel plans of countries to visit, looking for ways to stay in power etc.etc.etc. Yes, it would be interesting to be a fly on the wall in those very important meetings between the "President of Palestine" and his Arab counterparts. 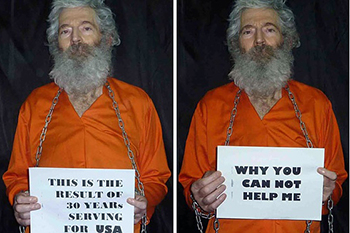 Robert Levinson, 67, an American citizen, is a retired DEA and FBI agent. In 2007, while researching a cigarette smuggling case as a private investigator, he was abducted in Iran and has since been held hostage.